Recently, both Venezuela and Ukraine have experienced substantial protests seeking regime change. In both cases it is important to recognize that protests are not always progressive nor are they deserving of support. In these two cases, neither movement is progressive. In Venezuela, the protesters are seeking a regime change that installs an opposition that seeks to move the country and its economy closer to the imperialists, the United States in particular. Latin America has been dominated by imperialism, especially the United States. A victory for the opposition in Venezuela would not only be a disaster for the the lower classes there, it would be a disaster for the region. Neither the regime of Chavez or of his successor Maduro are socialist, but they represent progress away from subservience to the United States. The regime is a patriotic one focused on national development and a welfare state. In addition, the regime’s Bolivarian policies have sought to make the entire region more independent of the United States. The regime was the victim of a US-backed coup attempt in 2002. Many of the same forces that worked against Chavez then are at work now. The regime has rightfully accused the United States of plotting with the opposition to bring about its downfall. Similarly, the opposition in Ukraine is made up of forces that would strengthen the hand of empire if they came to power. The opposition forces include liberals that seek closer ties to Western economies and also neo-fascist groupings. Fascist militia groups with their flags and uniforms are a regular feature of the protests there. At the same time, we should recognize that the regime there is not socialist or even necessarily progressive. It is that the alternative there would be worse. An opposition victory would in all probability result in greatly strengthening imperialism as a whole and it would give a boost to the rebirth of traditional fascism in some parts of Europe. It is important to understand the difference between progressive movements and movements of reaction. Too often groups like Occupy or Anonymous throw uncritical support behind every protest that comes along. It is important to remember that even the Nazis had protests. Large numbers of people in the streets does not translate into progress. It is important to understand how such conflicts play out in the context of the global class struggle. It is important to critically oppose imperialism everywhere. It is important to seek to put real revolutionary scientific, Leading Light, leadership at the head of the anti-imperialist struggle. Only then will there be a chance of defeating empire once and for all. A long-term politics of the Ukrainian bourgeois government, as well as the economic crisis, created unbearable life conditions for the most citizens of the country. During last six months Yanukovich’s regime promised to solve a substantial part of the economic problems by means of European integration. A sudden rejection of declared plans provoked mass discontent and protests. This process was of a classless and mostly grassroots character. The most prepared for it appeared to be nationalist movements used by the liberal opposition as a street impact force. That’s why the protest acquired anticommunist and even fascist features. The forces purporting to take power like Yanukovich’s bureaucratic apparatus are unable to meet the people’s needs and won’t be able to solve the issues of the day. Western and Russian imperialism feels no sympathy towards Ukrainian citizens and will just use the situation in its favour, i.e. they will try to have their financial benefit and – in the case with the West – will try to create chaos on the borders of Russia. All these forces are interested in inciting the fraternal nations against each other and will be doing it either secretly or openly. Anticommunist and anti-Russian hysteria, outrage on our mutual Soviet past – these are the main features of the nationalist state that is being formed now. The information about demolition in communist and left parties headquarters, about beating common communists and work activists, Lenin’s monuments demolitions clearly show that the fascist revanche being traced in the Baltic and European countries has already engulfed the Ukraine, Russia’s fraternal country. We, the undersigned left-wing activists, communists and anarchists of Russia, declare our protest and demand to stop the persecution of our comrades! We call upon all of the citizens of the Ukraine to express a distrust of deputies of the Verkhovna Rada using any available information resources, to organize communities on a residence and in the labour collectives to create self-defense groups, institutions of self-governing and reliable mechanisms of popular will. We call upon the citizens of Russia who are ready to take a direct part in helping the Ukrainian people, to contact the Antifascist Headquarters of the assistance to the Ukraine. 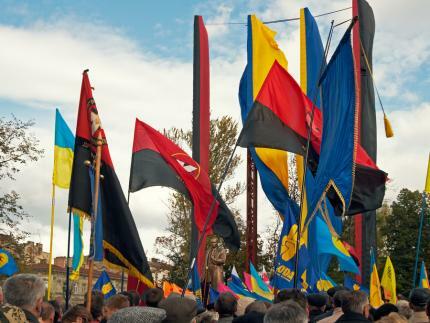 We call upon the communist and left-wing parties and the antifascist organization of the world to pressure their governments to prevent establishing of a fascist regime in the Ukraine!